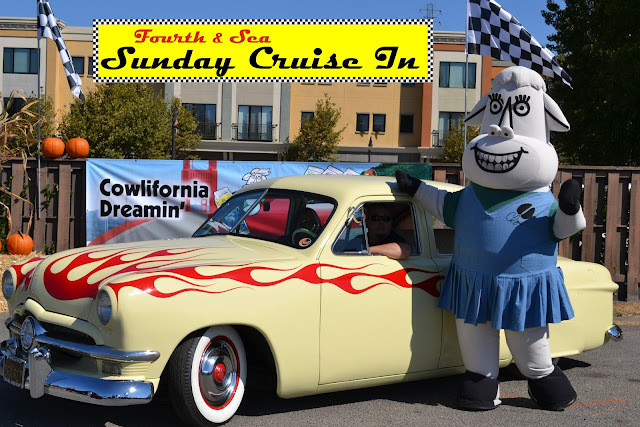 The LAST Sunday Cruise In of 2018 is THIS MONTH on SEPTEMBER 30th from 11am-2pm at Fourth and Sea Fish and Chips, 101 4th St. (at C St.) in downtown Petaluma. 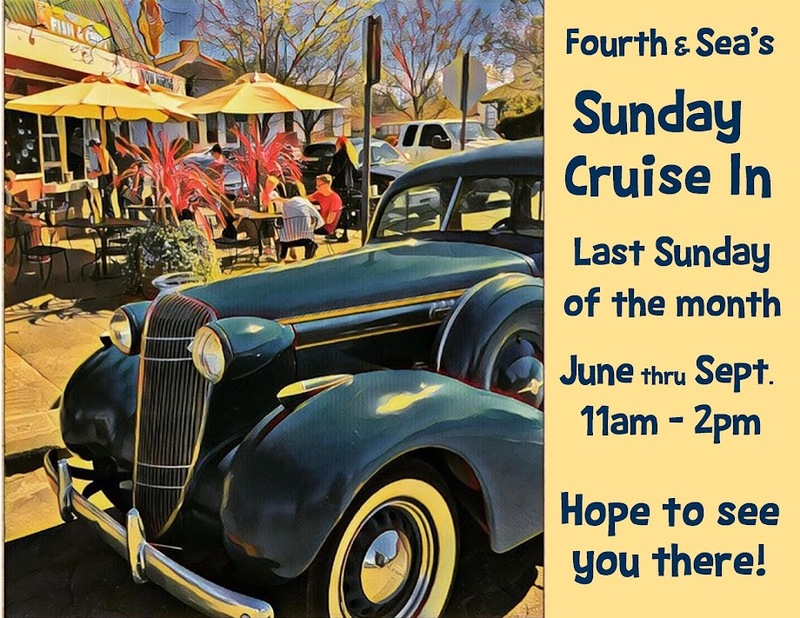 The Sunday Cruise In is a free classic car cruise-in held the last Sunday of each month from 11am-2pm, June thru September (weather permitting), at Fourth and Sea Fish and Chips in downtown Petaluma. This is our 9th year holding the event. The event features classic cars, classic food, classic oldies/rock music, a free raffle, and the presentation of the Sunday Sunday Cup Sundae (a HUGE ice cream sundae) to the owner of the Judge's favorite car. For directions to Fourth and Sea, click here. By all accounts the corner of 4th and C Streets in Petaluma was one of the hot cruising destinations back in the day. 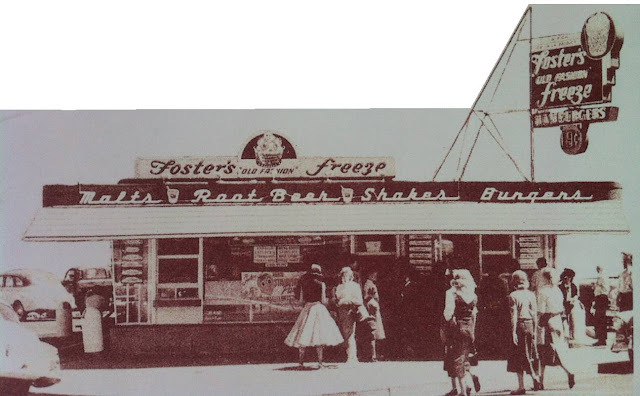 Fosters Freeze was in business at this location for 50 years before it became Fourth and Sea in 2001. Now, once again, this same parking lot is filled with the classic gems of yesteryear - both cars and people alike! Below are some pictures and descriptions of some past events to give you an idea what the Sunday Cruise In is all about. For most current info, go to our Facebook page. 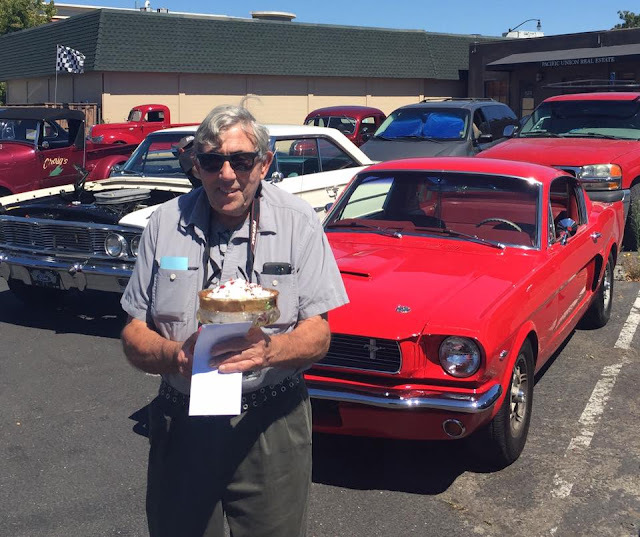 Congratulations to Carl and Sandy Bittinger for winning the Sunday Sundae Cup at August 2016's Cruise In here at Fourth and Sea with their beautiful, shiny, bright red 1966 Mustang Fastback. We'd like to give special thanks to Petaluma Pie Company, Vintage Bank Antiques, Heebee Jeebe, and Buffalo Billiards for donating prizes to the free raffle, and thank all the people who helped make the event a success: Dennis Hautzenrader for helping with set up and break down, Mike and Mary Harrington for playing the music, John Maher for being the Master of Ceremonies, and of course, all attendees who brought their motor driven works of art and works in progress. We hope to see you all on the last Sunday of September, the 25th, and hope the weather is as fine as it was last Sunday. 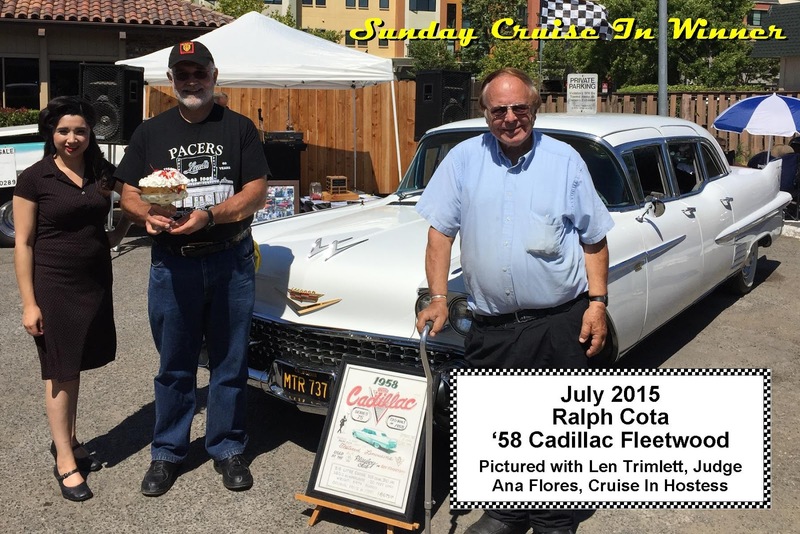 At our July 2015 Sunday Cruise In Len Trimlett did the honors of judging which car would win the coveted Sundae Cup. Len chose Ralph Cota's gorgeous 1958 Series 75 Cadillac Fleetwood Limo as the winner.Good work, Len, and congrats to Ralph! Thanks for cruisin' down to share your beautiful car with us. 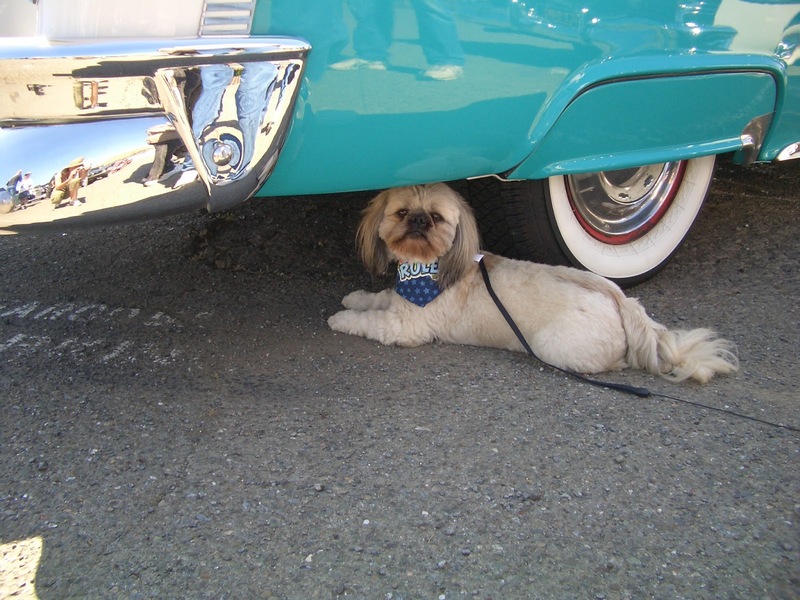 At the May 2015 Cruise In, Petaluma Pete was our Celebrity Judge tasked with the difficult job of picking the Sunday Cup Winner. He chose Bob and Michele Rose's 1960 Jeep FC 170. And who could blame him? It's cute as a bug! Bob bought it 24 years ago in Colorado, where it was a working jeep and no so shiny and tricked out. But he just fell in love. There were only 3000 of these made over 7 years, and it came in a short bed, too. Congrats to Bob and Michele! 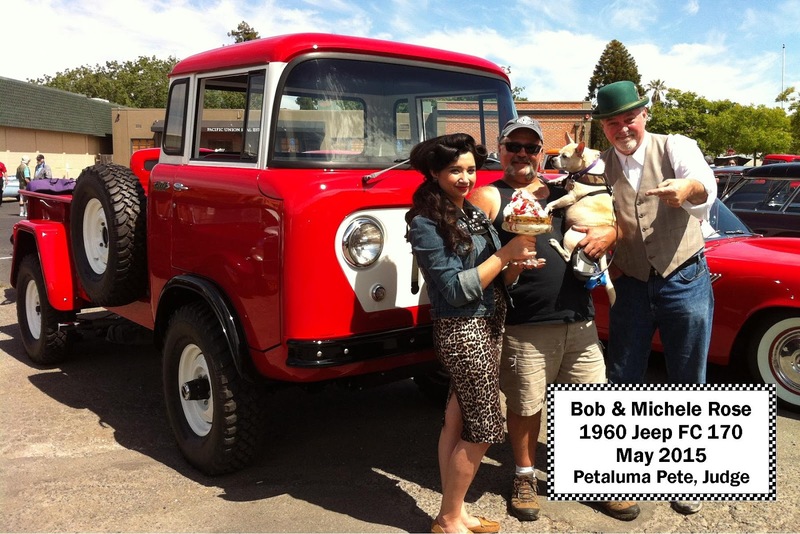 Bob is pictured here with his dog, Ana Flores (Fourth and Sea's Sunday Cruise In Hostess), and Petaluma Pete. Petaluma Pete, aka John Maher, has joined us as our Celebrity Judge at a few other events, also. In this pic, he chose Nick and Peggy Houmis's 1960 Imperial to take the honors...and the ice cream! Congrats Nick and Peggy! Jim's truck, which he's had since 1959, actually appeared in the movie "American Graffiti" and was the car he took his wife of 51 years, Leslie, out on their first date. Leslie wasn't here on Sept. 29, but Clo made a great stand in! Jason Grossman, CEO and son of Mrs. Grossman of Mrs. Grossman's Sticker Factory fame and a supporter of the Cruise In, was our Celebrity Judge to choose the car to win the Sundae Cup Trophy at one event in 2013, and brought his Superbird, one of the 20 cars in his muscle car collection for which he also raffled off a tour at the Cruise In! Paul Fennell and Jason Grossman (Judge) pictured with Paul's winning 1963 Split window Z06 Corvette. Paul owns the car with his wife, Anne, who wasn't with him this fateful day! Congrats to Marr Olsen (center) for his 1963 Chevy Nova SS, pictured here with girlfriend Cindy Steffy and Jesse. 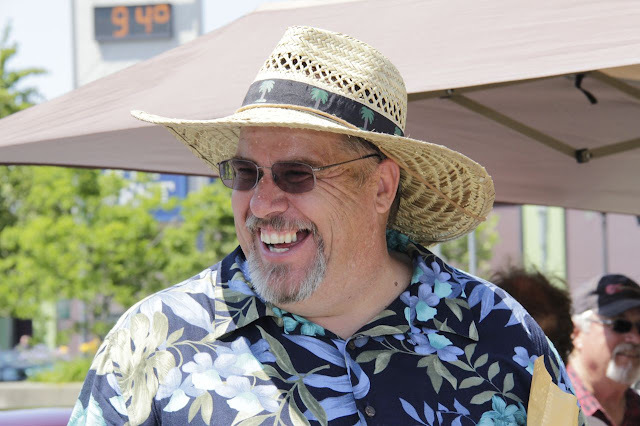 Petaluma Speedway's Rick Faeth was our celebrity judge at one event. Rick also brought along a couple of racecars, and Sparky, one of the car's drivers, to the delight of the motorheads and race fans in attendance. 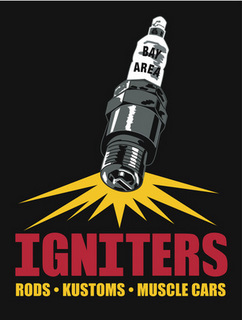 We are very grateful to both Rick and Sparky for sharing their cars, their knowledge, and their time with us! The car Rick chose for the trophy wasn't a hot rod or a muscle car....or even an American car, for that matter! Congratulations to Hudson and Minnie Graham for their beautiful 1958 Austin Healey. At one event we had a horseless carriage show up, trailered in by Dave Lund who actually got it running! 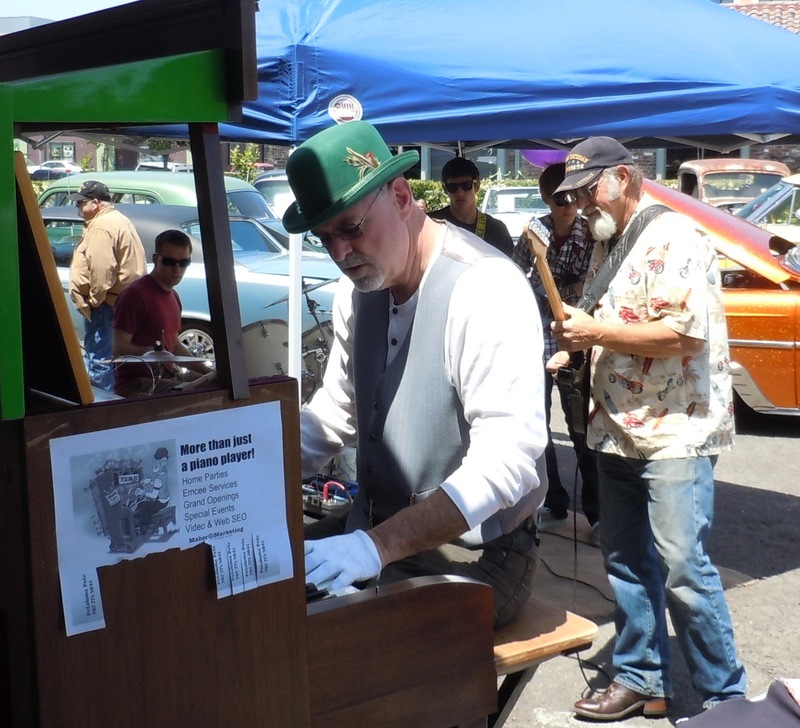 Petaluma Pete, our Celebrity Judge that day, jammed with the band on his infamous piano, and the car he chose to win the Sundae Cup came all the way from Vacaville!! Our Contact Us page will give you all our numbers, email, and web addresses to answer any questions you may have. Hope to see you at the next Sunday Cruise In!